Since it has such a large screen, the iPad can handle a number of more advanced capabilities than smaller devices in the iOS family – the iPhone and iPod touch. In fact, some of iOS 5’s coolest features are exclusive to the iPad. Following our collection of 9 obscure iOS 5 tips & tricks, let’s take it a step further and get into what’s new for iPad users in particular. All of these iPad-only features improve how common tasks can be completed, so it’s not just power users who can benefit. Even the most casual iPad user will be able to take advantage of these improvements. Web browsing on iOS devices is better than on any other mobile platform, but switching between open pages wasn’t so convenient before iOS 5. Now Safari on iPad is more like Safari on Mac and Windows, with full support for tabbed browsing. When you’re in the midst of a vicious web browsing session in Safari, you can rapidly go through a ton of different pages. By tapping and holding either the Back or Forward button, a pop-up containing a convenient list of your recent history will appear. iOS 5 introduces a new way to look at your calendar on the iPad – year view. 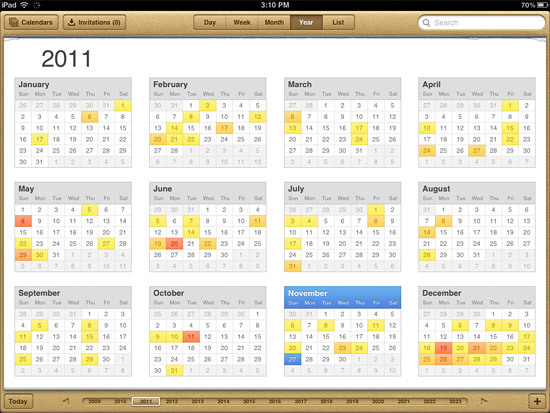 This turns your calendar into a heat map of your year’s events. The more events you have scheduled on a day, the darker it appears. Are you used to typing with your thumbs on your iPhone or iPod touch? The iPad’s larger size makes it hard to do the same thing, but with iOS 5 you can split your iPad’s keyboard in two. Just tap and hold anywhere on the keyboard with two fingers, then drag each finger in the opposite direction towards the sides of the screen. The keys will shrink and each half of the keyboard will be pinned to one side. Much easier on those thumbs! The iPad’s keyboard got another upgrade, too. By holding down the Hide Keyboard button in the lower-right corner of the screen, you can choose to Undock it. Now when you hold the same button and move your finger up and down the screen, the keyboard moves with it. Top, middle, bottom – it can move anywhere you put it, even in split keyboard mode. The iPad now supports a number of convenient multi-touch gestures thanks to iOS 5. For example, you can use 4 or 5 fingers to swipe up on the screen and reveal the multitasking bar. This is in comparison to pressing the Home button twice, of course. You can also swipe left and right with 4 or 5 fingers to switch directly between open apps. It’s kind of like hitting Cmd+Tab on a Mac to cycle through running programs. Finally, iPad users can use 4 or 5 fingers to pinch inwards on the screen and go back to the home screen. Having trouble getting your multi-touch gestures working? Make sure they’re enabled by going to Settings > General > Multitasking Gestures.